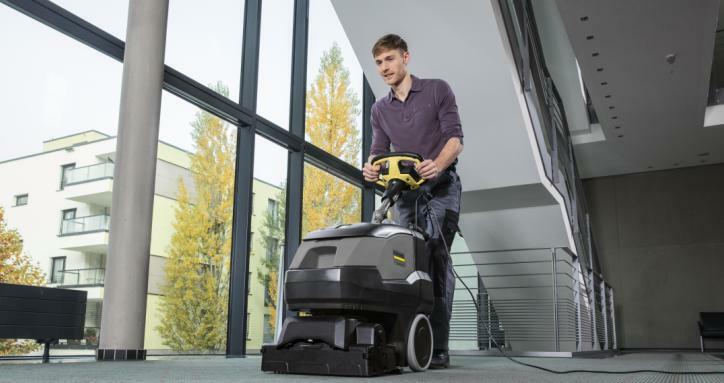 Kärcher is introducing the new BRC 40/22 C deep carpet cleaning machine for deep and intermediate cleaning of carpeted areas. The head, which can rotate 200° to both sides, makes the machine extremely manoeuvrable, and thereby reduces cleaning time by up to 30%. Obstacles can also be navigated easily. There is particular emphasis on intuitive and ergonomic operation of the machine; a simple rotary switch for setting the operating mode, changing of the roller brush and squeegees without tools, a separate cable guide and height-adjustable handlebars are just some of the features that contribute to this. Carpet cleaners perform three functions in a single step; spray nozzles on the front of the machine head apply the cleaning agent solution. A roller brush works the cleaning solution deep into the carpet pile, and then the squeegee wipes it up again, which significantly reduces drying time. When using conventional carpet cleaners, up to 30% of the cleaning time is taken up by getting the machine back into its original position in order to clean in parallel strips. But this is not the case with the BRC 40/22 C. Thanks to the head, which can be rotated 200°, this is not necessary. With a quick turn of the steering wheel, the machine is ready for the next strip, in the opposite direction. The machine can also be manoeuvred easily out of corners; with the head turned 180°, the machine can be driven out backwards. An additional benefit is that the rotating motion of the roller brush, which works the cleaning solution into the carpet also helps the operator by providing an additional traction drive, both forwards and backwards. When the BRC 40/22 C is used for deep carpet cleaning, a cleaning agent such as CarpetPro RM 764 from Kärcher is mixed into the fresh water. The area performance in this operating mode is around 350m²/h. The machine is also suitable for intermediate cleaning. If the CarpetPro Cleaner RM 768 with patented Kärcher iCapsol technology for dirt encapsulation is used, then no vacuuming is necessary. The vacuum unit is simply switched off, which increases the area performance (up to 1,000m²/h), saves energy and reduces noise emissions. The surface is dry again after just 20min – 30min and the encapsulated dirt is simply vacuumed up with a vacuum brush during the next maintenance clean. Out of a total of 110 entries, the BRC 40/22 C is one of three products nominated for the ISSA Innovation Award in the category ‘Machines, Accessories & Components’. A total of nine products in three categories made it to the final round.